Township of White River (Single Tier Algoma)Record Owner? Log in. In 1887 the post office was established, taking its name from the river that flows through the townsite. A statue beside the Trans-Canada Highway honours Winnie the Pooh, the lovable character from A. A. Milne's children's books. Winnie's name was a contraction of Winnipeg. hometown of Lt. Harry Colebourn, who bought the bear cub for $20 at White River railway station while he was passing through on a troop train bound for Valcartier, QC. Coleboume, a veterinarian with the Second Canadian Rifles took Winnie to England. When his regiment headed for the battlefields of France, Winnie was left in the care of the Zoological Society of London. Winnie went to the zoo in 1914, and shortly after that Milne took his young son Christopher Robin there. Christopher adored the bear cub -- and the rest is literary history. 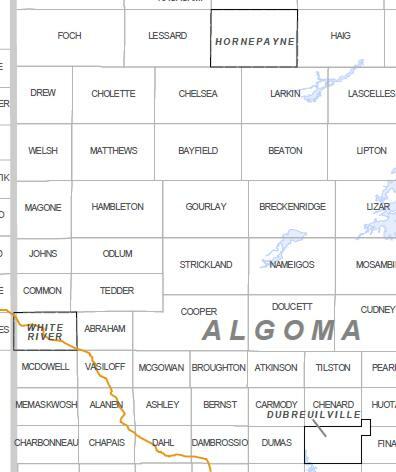 Have something to say about Township of White River (Single Tier Algoma)?